At approximately 11:00 on Monday, 18 June 2018, civilian persons backed by Plainclothes security officers intruded an event organized by the Commission of Detainees and Ex-Detainees in cooperation with the Detainees Committees of the National and Islamic Factions and attacked the participants. 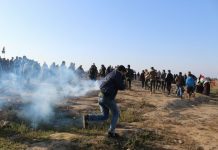 The Palestinian Center for Human Rights (PCHR) condemns use of civilian persons and plainclothes security officers to suppress and undermine the right to peaceful assembly in the Gaza Strip. PCHR also emphasizes that going undercover in plainclothes does not exempt the security services from its responsibility for dispersing the peaceful sit-in and attacking the participants and journalists. According to PCHR’s investigations, the Ministry of Interior permitted the Commission of Detainees and Ex-Detainees to organize the sit-in in al-Saraya Square in Gaza City to call for end of the sanctions on Gaza and division. According to eyewitnesses, once the sit-in, where hundreds participated, started, a number of young men arrived; some of whom came out of a nearby mosque wearing Kufiyas and white bowlers, raising banners and chanting “People Wants Downfall of ‘Abbas.” As a result, an altercation occurred, and some of the organizers asked the intruders to unify the slogans; however, the latter refused. Hand-to-hand fighting then occurred between those in the sit-in, and it has later turned out that there was deployment of plainclothes security officers between the participants and they along with those officers who intruded the sit-in destroyed the stage and attacked the participants. Moreover, whoever photographed what happened was pursued, attacked and forced to delete all photos and videos. PCHR is gravely concerned over employmeny of civilian persons and plainclothes security officers to undermine the right to peaceful assembly and warns of the gravity of this on civil peace. Thus, PCHR calls upon the Attorney General to open a serious investigation into what happened and hold those responsible accountable. PCHR also calls upon the duty bearers in the Gaza Strip and security services to respect and protect the right to peaceful assembly that is protected under 1998 Public Meetings Law and PA’s binding international standards. PCHR emphasizes that each person has the right to information access and impart it via different means, including the right to photograph and impart various events without the intervention of security services. Thus, PCHR calls upon the security services to stop the policy of confiscating cameras and deleting materials on their memory cards to bury the truth.